Lets not forget that its not only Russia……. Several people were injured, two cars were set ablaze and windows were smashed at the home of a gay British Red Cross worker and his Haitian partner’s private engagement ceremony, in Port-au-Prince Haiti late Saturday night. The house was violently attacked by local citizens throwing molotov cocktails and rocks and were stopped by Police just in time to prevent people being killed, inspector Patrick Rosarion told AFP..
“This is a criminal act and homophobic,” said Charlot Jeudy, an official from Kouraj (Courage), a group that defends the rights of homosexuals in Haiti. 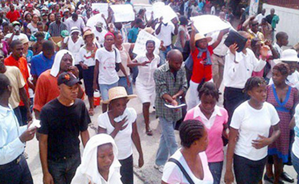 This new rash of violence against the Haitian LGBT community was provoked by a march by the Haitian Coalition of Religious and Moral Organizations that incorrectly claimed a gay marriage bill was heading to parliament. Following the march, 47 anti-gay attacks took place in the span of one week, with mobs wielding blades, cement blocks, sticks, and iron bars.